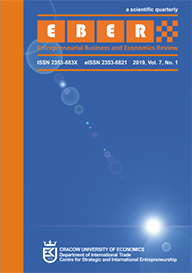 ˜Entrepreneurial Business and Economics Review' (EBER), as multi-disciplinary and multi-contextual journal, is dedicated to serve as a broad and unified platform for revealing and spreadingÂ economics and management research focused on entrepreneurship, individual entrepreneurs as well as particular entrepreneurial aspects of business. It attempts to link theory and practice in different sections of economics and management by publishing various types of articles, including research papers, conceptual papers and literature reviews. Our geographical scope of interests include Central and Eastern Europe and emerging markets, however we also welcome articles beyond this scope. Starting from now there is an open and permanent call for papers for all regular issues. Please submit your article on the pernament base. The articles must be between 20 000 and 40 000 characters (including spaces as well as all necessary tables, figures, graphs and illustrations, the list of used references and any appendixes if needed). If you exeed 40 000 characters you will be asked to pay the publishing fee, but if you keep the required lengh of the article we don't charge anything.